Airmen clean an A-10 Thunderbolt II in an aircraft wash rack at Davis-Monthan Air Force Base, Ariz., July 24, 2018. The main purpose of the wash rack is to clean equipment while preventing contaminates from entering the environment. 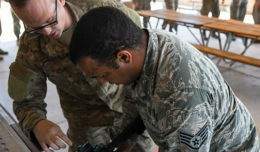 Senior Airman Shawn Mabry, a 354th Aircraft Maintenance Unit A-10 Thunderbolt II crew chief, scrubs down an A-10 from above at Davis-Monthan Air Force Base, Ariz., July 24, 2018. 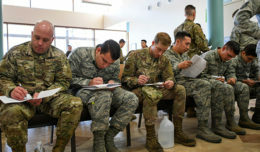 The cleaning process can take a team of airmen nearly four hours to complete. 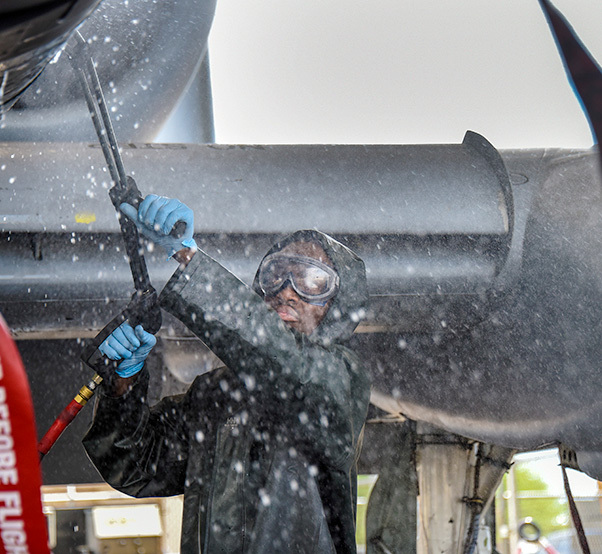 Airman 1st Class Keon Oliver, 355th Aircraft Maintenance Squadron weapons load crew member, hoses down an A-10 Thunderbolt II with a rinse gun at Davis-Monthan Air Force Base, Ariz., July 24, 2018. 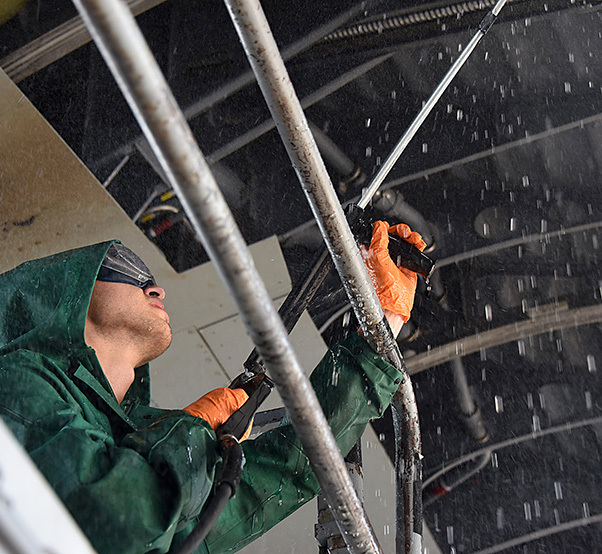 Airmen use pressure washers with more than 3,000 pounds of pressure per square inch to remove debris from the aircraft. 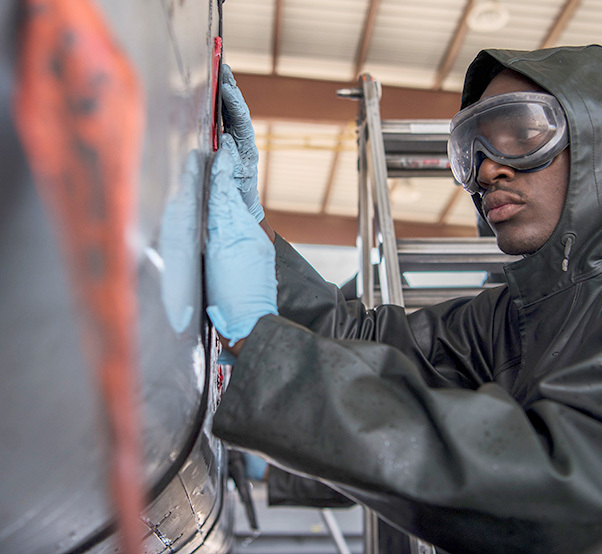 An Airman from the 355th Aircraft Maintenance Squadron cleans the underside of a C-130 Hercules at Davis-Monthan Air Force Base, Ariz., July 24, 2018. 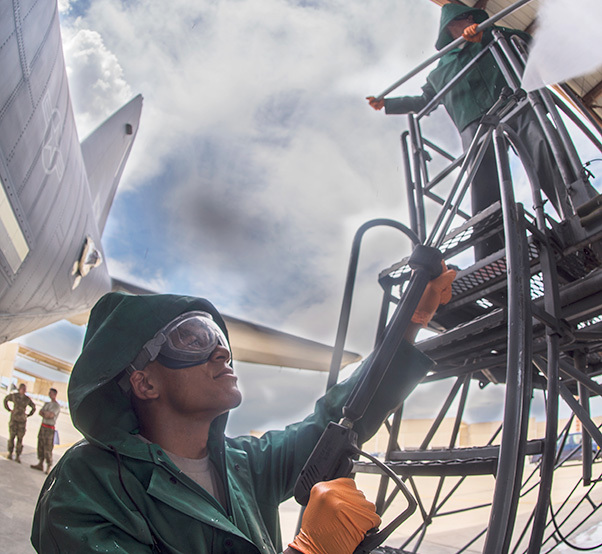 Airmen use pressure washers with more than 3,000 pounds of pressure per square inch to remove debris from the aircraft. Airmen power wash and clean the side of an A-10C Thunderbolt at Davis-Monthan Air Force Base, Ariz., July 24, 2018. Airmen use pressure washers with an output of more than 3,000 pounds of pressure per square inch to clean the aircraft. 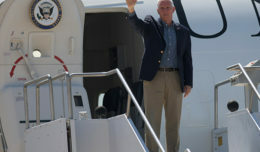 Airman 1st Class Oliver Keon, 355th Aircraft Maintenance Squadron load crew member, cleans the belly of an A-10C Thunderbolt at Davis-Monthan Air Force Base, Ariz., July 24, 2018. 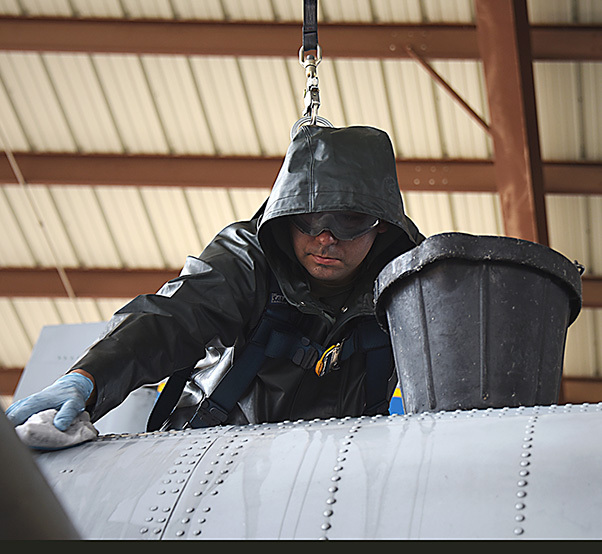 The A-10s are washed every 180 days to prevent buildup and corrosion.